CONCORD, Mass., Jan. 20 (SEND2PRESS NEWSWIRE) — Today, Applied Analytics, Inc. (AAI) unveils the ePurge X, a next-generation solution for air-purging electronic enclosures. Unlike conventional purge controllers, this new offering is entirely solid state and much more in line with the design of AAI’s highly automated process analyzers. The ePurge X is slated to be available both to distributors and the general public in March. AAI is also introducing an entirely new concept with the utility-saving feedback feature. The ePurge X uses a digital mass flow sensor to monitor the flow rate of purge gas through the enclosure. Along with the differential pressure, this flow value allows the ePurge X to provide data on instrument air consumption by specifying the exact demand that will keep the enclosure safely pressurized without wasting any extra utilities. 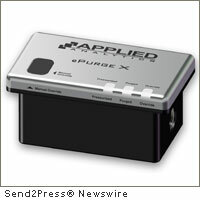 For additional information about the ePurge X, visit www.a-a-inc.com/epurgex . News issued by: Applied Analytics, Inc. Original Keywords: Applied Analytics Inc, Andy Burgess, Massachusetts news, air-purging electronic enclosures, electronics, manufacturing, facilities, safety devicesm AAI, process analyzers, mass flow sensor, air consumption, purged system, Yoav Barshad Applied Analytics, Inc. Concord Massachusetts CONCORD, Mass. News Source: Applied Analytics, Inc.
More from Applied Analytics, Inc.
RSS News Feed for Applied Analytics, Inc.
REFERENCES: Electronics News, Applied Analytics Inc, Andy Burgess, Massachusetts news, air-purging electronic enclosures, electronics, manufacturing, facilities, safety devicesm AAI, process analyzers, mass flow sensor, air consumption, purged system, Yoav Barshad Applied Analytics, Inc. Concord Massachusetts CONCORD, Mass.